Rice is a staple for more than half of the world's population. Rice is a staple food for more than half of all people worldwide. But in many regions, rising temperatures and more extreme weather are making it harder to grow rice. For example, in the coastal wetlands of Vietnam’s Mekong Delta, droughts are becoming more frequent. When there’s not enough freshwater flowing down the Mekong River, more salt water from the South China Sea washes into coastal waterways. It ends up on fields and in soil, where it can devastate rice crops. It’s a problem that will only get worse as rising seas push even more salt water inland. 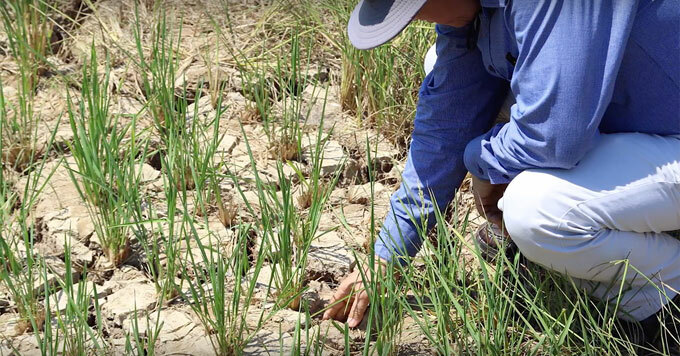 Other rice farmers have switched to raising shrimp, which can handle the saltier conditions. So as the climate warms, farmers around the world will likely need to change how – or what – they farm. Image credit: IRRI video screen capture.